Fez: Thank you for taking some of your time to chat with me about Star Trek in general.... First tell the readers who you are and what you do as your "day job". SD: Being a child of the 60's, how can I answer that question without writing a book? In 2nd grade all we talked about was Trek. My Dad made plywood Phasers and Communicators and we played Trek during recess. I was Spock by the way – had the largest ears. SD: Our radio station had a policy not to use sirens in commercials. I had the idea if we could find a phaser sound from TNG and work audio magic, we could get the same perception without making drivers nervous. We did a Google search: “Star Trek New Phaser Sound” but typed “Star Trek N”. Up came “Star Trek New Voyages”. After seeing “In Harm's Way” I was hooked. Fez: What do you think of the quality of the writing and the episodes themselves? SD: The best Trek has always been about story. It's the reason STP2 holds up so well. STP2 truly IS the next 5 year journey. SD: I came to simply help any way I could on the "Mindsifter" production. 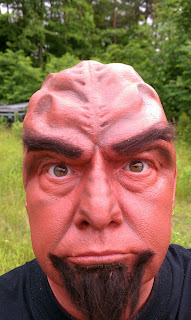 Thanks to John Carrigan's thoughts on what Kargh's office should have and James' spur of the moment asking, I was lucky to play a Klingon Guard. I also did some “Bridge Chatter” for “Origins”, some small audio recording, grip, and bathroom toilet paper changing on “Mindsifter”. SD: 18 hour days, no sleep, no pay: how can I best say this.....FUN AS S**T. When I first walked into the green room in Port Henry it felt like home. When you read on the forum at www.startreknewvoyages.com people you're a part of “the family”, it's true. I was only there for the first ½ of a two week shoot and I'm doing this interview with Fez. I feel a part of the “STP2 Family“. All the staff took great care getting the shots perfect. I will say that damn transporter set needs some A/C. Fez: And you are right you are apart of the family... Any other thoughts you'd like to share with our readers? SD: I'm privileged working with and knowing everybody that's a part of STP2. I was lucky to be on camera, but there are so many people that make this a part of real Star Trek history (too many to mention here). They're the true stars. 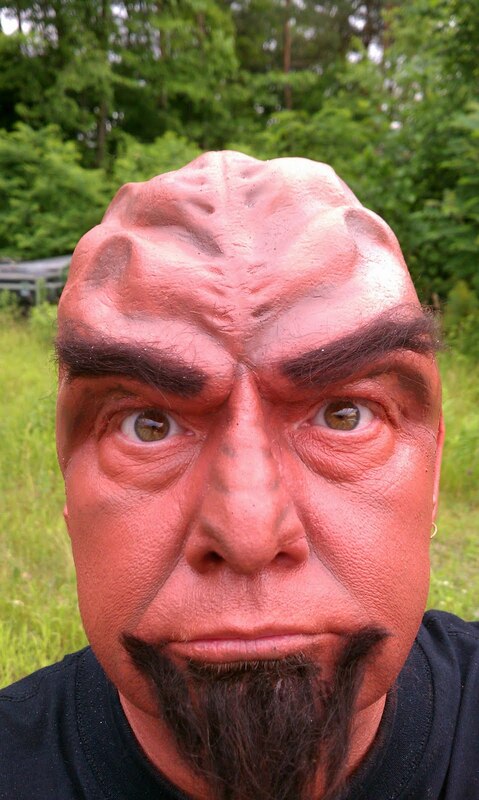 On a side note; I believe (I'm sure I'll hear about this on the forum) I'm the only other actor to play a bald Klingon besides Chris Plummer. We spent a long night (2am) watching a print of “The Child” and “Kitumba”. I wish you all could have been in that room....it was EPIC. It's amazing how comfy that greenroom feels when it's full of "family"!